What causes operating companies to sell their patents? Our intuition tells us that patent sales take place when the seller is in financial distress or the company is underperforming. We wanted to test whether the data aligned with our intuition. “When Do Operating Companies Sell Their Patents?” Richardson et. al. IPWatchdog (August 2016), available here. With an ever-increasing client interest in international patents, we wanted to explore how patent ranking for EP patents has been conducted and how those ranking systems can be integrated to allow comparison and ranking with US patents. Here are our findings. “Finding the Best Patents – Comparative Patent Ranking Systems – Citations Still Matter.” Richardson et. al. IPWatchdog (August 2016), available here. When do Operating Companies Sell their Patents? What causes operating companies to sell their patents? Our intuition tells us that patent sales take place when the seller is in financial distress or the company is underperforming. We asked ourselves whether data aligned with our intuition. We looked at transaction data for sales from corporations. We studied the financial condition of 20 companies across 41 transactions over the last 6 years (post 2008 financial crisis) and looked for correlations between a company’s financial health and the sale of patents. We used sales from corporations to NPEs as a proxy for all corporate patent sales. In the analysis, we found that 78% of large patent sales (>= 10 patents transferred) occurred when the companies were underperforming the QQQ ETF (an exchange-traded fund based on the Nasdaq-100 Index, which was used as a proxy for the market). Further, including the smaller transactions (4-9 patents transferred), the overall share of transactions that occurred when the companies were underperforming the QQQ ETF was 71%. Read the rest of the article at IPWatchdog. Over the past 18 months, our clients have begun to show greater interest in international patents (e.g. non-US). Increasing client interest in international patents corresponds with the general rise in importance of international patents (continuing ascension of the Chinese market, potential for unitary patent for Europe), more anti-patent owner decisions in the US, and greater patent litigation outside the US. Client interest spurred us to review our existing patent evaluation tools and methodologies for potential improvements. We found that our current ranking system can be used for EP patents, especially with further calibration using EP data sets, and also that an integrated ranking approach that allows comparison and ranking of EP and US patents relative to one another is possible. Read the full article at IPWatchdog and about the surprising importance of citation analysis in ranking systems. ROL Group partners Kent Richardson and Erik Oliver have again been named in the IAM Strategy 300 – The World’s Leading IP Strategists. This is the eighth year that Richardson has been named to the list and the seventh year that Oliver has been named to the list. Bloomberg’s reporting of the quarterly patent market results including coverage of assets purchased for cardiovascular devices, digital mapping and wearables. Bloomberg uses ROL data for the market reports. 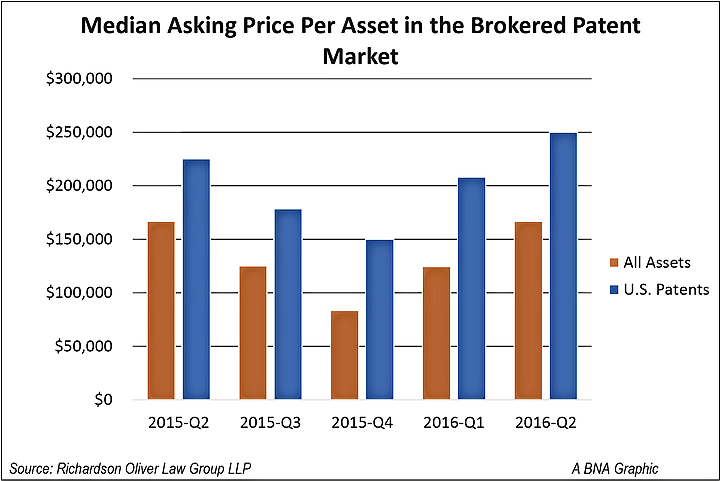 “Heart Device Patents Sell in Brokered Market for Q2.” Marks. Bloomberg BNA (August 2016), available here.